Unique stuffed pork chop recipe awaits you! 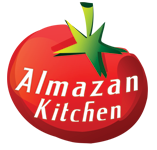 Very unusual pork recipe you can find only on AlmazanKitchen’s channel! Slow cooked meat, stuffed with awesome fresh veggies, fully infused with its flavors and under natural sauce! We can’t even find words to describe this dish! It’s natural, amazingly tasty and soft! The main reason for it is that it was made on fire using fresh and natural ingredients, fresh water and clay cookware! Make holes in pork chop using sharp stick. Slice handful of green onions, young garlic and carrot into medium sized strips, place them inside holes in the meat. Preheat clayware casserole, grease it with oil well. Place stuffed meat into clayware casserole. Add 2-4 garlic cloves, 2 rosemary sticks, 1 tsp. of black pepper and few rounds of garlic. Fill half of casserole with warm water. Cover the casserole with lid, slow cook for 5 hours. When 20 min till ready salt well! Preheat the pan, grease with oil. Slice 100g of smoked bacon, toss it into the pan. Remove foot-stem from the handful of Brussels spout, toss them into the pan. Fry for few minutes. Add few tablespoons of liquid from the casserole to the pan. Stir well until rich saucy consistency. Serve everything together, do not forget to use sauce!